The review is for MBOX Converter version 2.1 also known as Thunderbird to Outlook Converter. The software works towards converting MBOX files to PST, MSG and EML files. In this review, I have discussed all the functional perspectives of the tool along with its benefits and shortcomings as well as per my experience. The product specifications are mentioned herein. The tool was tested on computer system with below mentioned specifications. 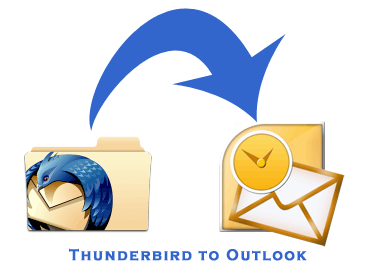 The steps involved in the installation of the product are quite simple and self defining and the process to download and install Thunderbird to Outlook Converter tool takes nothing more than just a few minutes. After installation is done, the initial window or interface of the tool offered me to select MBOX file that needs to be converted by clicking on “Open” option. It gave me two options to select from i.e., “File” and “Folder”. I selected to add file for conversion. By clicking on “Browse” button, I selected the file path and the MBOX file. Next, by clicking on “Add” button, I added the desired file and the conversion process started. Automatic scan was then initialized to upload the selected file. It didn’t take much time as the file was not too large. Actually, the scanning time depends on the size of the file. Once the scan finishes, the tool interface appeared with all the contents of the file. I selected an item (email) and the related attachment was appeared in the “Attachment” tab of the tool. I switch to another email and the “Attachment” tab gets updated with that email’s embedded attachment. Exporting selective emails by checking the checkboxes and then clicking on “Export” button by right clicking the selected email. I selected to export selective items and then I right-clicked on an email to enable export option. When I clicked on “Export” button a pop up window opened with distinct “Export Options”. The tool offered three options to export an MBOX file that includes PST, MSG and EML. 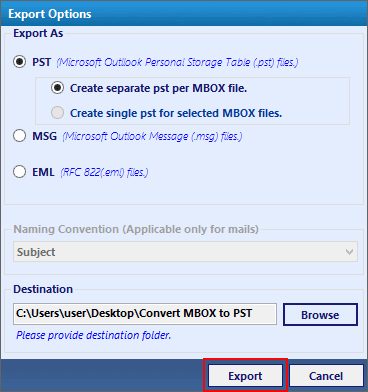 I selected to export MBOX file into MSG as I further need to import these files in MS Outlook. Selecting MSG format offered to save files with given naming convention options. I found this feature really helpful as it allowed me to save single email per file in a better and more organized way. Next, I selected the destination location for storing converted MBOX files by clicking on the “Browse” button. And finally I clicked on the “Export” button to complete the process. Clicking on “Export” button started generating “Export Report” which provided me to save this report for future reference. Next I started MS Outlook and imported the converted MSG files into the application. Later on, I checked the other export options mentioned in the tool that includes saving file as PST and EML. Maintains Data Structure: It renders complete conversion of MBOX files and all the attachments kept intact within the emails files. Flexibility Saving PST Files: Saving files as PST offers either creating separate PST for each MBOX file or creating single PST for selected MBOX files. Stand-alone Application: MS Installation is not required to convert files into PST, however, accessing the converted files need Outlook installation. Better Search-ability: Saving Files as EML and MSG format enables saving files with appropriate names and further simplifies search procedure. Time Saving Features: Export report lets users know about which files have been exported from a particular folder and helps saving time as well. Taking into consideration the performance and work-ability of the tool, I can say that it is complete software with all potential features that meets the expectations of a basic user in all aspects. Moreover, simple interface, basic system requirements and fast performance of the tool makes it quite persuasive. Moreover, the availability of trial version enables users to test the tool and clear all doubts (if any) about the functional features and its performance. The ability to preview all MBOX files and converting 25 files in all given formats, i.e., PST, EML and MSG helps in getting better understanding about the tool. As MBOX files are flexible in nature, i.e., it works on Windows, Mac and Linux Operating system, so the tool should match that aspect too. Likewise MBOX files, the tool must be flexible to work on multiple platforms for more scalability.